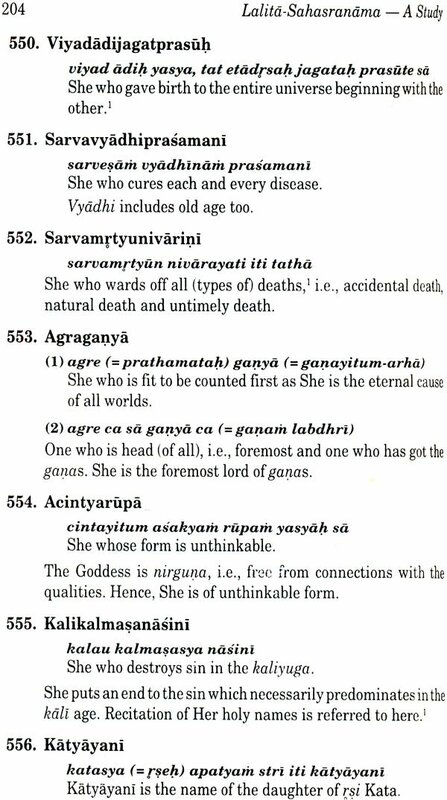 A medieval work of unknown authorship eulogizing Sakti: the Mother Goddess, this Sahasranama is not just a masterly Sahasranama is not just a masterly exposition of Sri Lalita's cult, but also sets out the deity's diverse epithets - like, for instance, Kundalini, Nirguna, Saguna, Parasakti or Brahman - which continue to evoke reverence as mantras with 'mystic powers. Also included among these names are the goddess's other panegyric description that have come to have profound, esoteric connotations in tantric practices - epitomizing, thus, the fundamental tenets of tantrasastra. 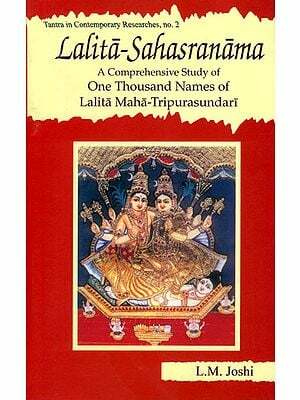 Here is a brilliant critical edition of Lalita Sahasranama meticulously analyzing, for the first time, each of Sri Lalita's thousand names - by a variety of themes, like the Goddess's conceptual representations, anthropomorphic forms, disposition, abodes, kindships/consorts, ritualistic worship, and her supremacy in pantheonic hierarchy. 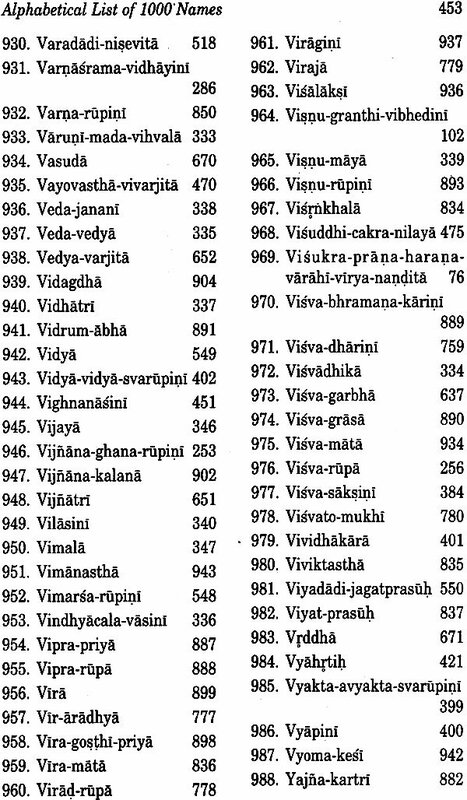 Also explaining and interpreting anew these thousand names on the basis of time-honoured commentaries, Dr. Joshi under-scores the high importance of Lalita Sahasranama in philosophy, Tantra, yoga, sahasranama literature, and ritual of various descriptions. Labhshankar M. Joshi is a 1953-born, distinguished Sanskrit scholars, with specialized, yoga, astrology and tantrasastra. For about two decades now, he has given courses in Yoga and Yoga Philosophy at Yoga Niketan - a professional institute of Baroda. And, besides his active involvement with a number of national/international astrological societies, he has been an "invited speaker" of the All India Radio as well. He holds PhD on tantrasastra. Currently teaching Sanskrit at the M. S. University, Baroda, Dr. Joshi has already authored three books and numerous articles on astrology, yoga and Tantra. The present book provides an elabrate and complete study of the Lalitasahasranama in its five chapters. Dr. Joshi discusses its date, home, and authorship and presents textual as well as critical and analytical study of the text. Dr. Joshi has explained and translated each and every name, by dissolving compounds. This he has done in Roman script so that foreigners may be able to grasp it promptly. He has also prepared a chart of the Kundalini Yoga described in the Lalitasahasranama. This will help readers to understand the topic at a glance. Dr. Joshi has spared no pains in presenting the book. His hard labour will be amply rewarded when it will receive warm reception in the circle of the scholars and devotees. Sanskrit language indisputably occupies the stage of sanctity among the languages used the world over. There are works in this language pertaining to innumerable branches of knowledge that are so varied and rich that they can only be tasted and not studied in detail in a single effort. 'Sanskrit literature' is vast and engrossing in its variety and form. 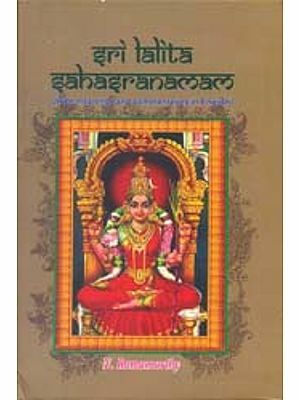 Of the many great Sanskrit literary works that have come down to us, one is the classic Lalita-sahasranama (LS), the magnum opus of an anonymous writer. Lalita-sahasranama is the gem of Tantrasastra, as it eulogies Sakti, an important member of the Hindu pantheon. Its position is higher than other sahasranamas. 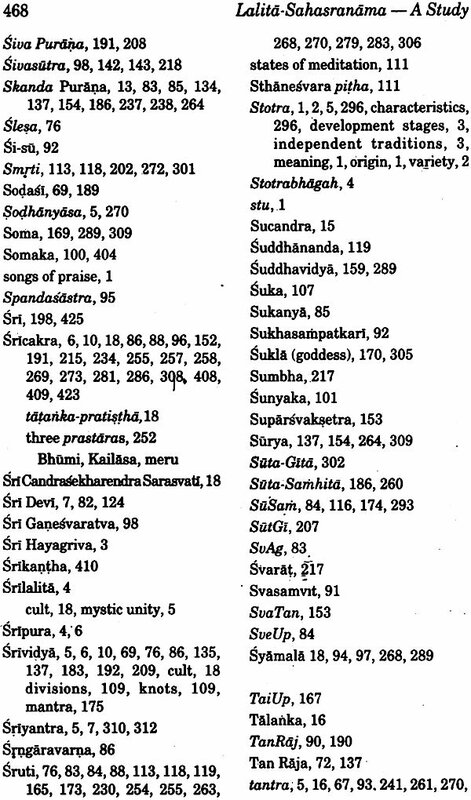 The LS itself says that among the texts on sahasranamas, ten sahasranamas on Goddesses, namely, Ganga, Bhavani, Gayatri Kali, Laksmi, Sarasvati, Rajarajesvari, Bala, Syamala and Lalita, are the leading ones. But the LS is the best among these texts. LS is the key to open the treasure of knowledge pertaining to the Tantrasastra. Famous for its lucidity and clarity, the LS has a special aura in its form as it incorporates the Tantric literature. The one thousand names in the text contain within themselves the fundamentals of the Sakta Philosophy. And so, the LS is the best guide for those who are desirous to know the fundamentals of Tantrasastra. Though the LS is written with special reference to the slaying of Bhandasura, the demon, it possesses various epithets of Goddess Lalita which embody secret doctrines underlying the Tantras. They elaborate various aspects of the goddess such as Nirguna, Saguna, Parasakti and Kundalini. Here, I have made a sincere and humble attempt to justify the place of the LS in Tantric branch of Sanskrit literature. But I feel as Kalidasa has said in the Raghuvamsa - titirsurdustaram mohadupena smi sagaram. the importance of this study lies in the fact that the LS, though commented upon by Bhaskararaya has escaped the analytical and critical pen of scholars. A complete study of the Lalita sahasranama ha snot been done so far. 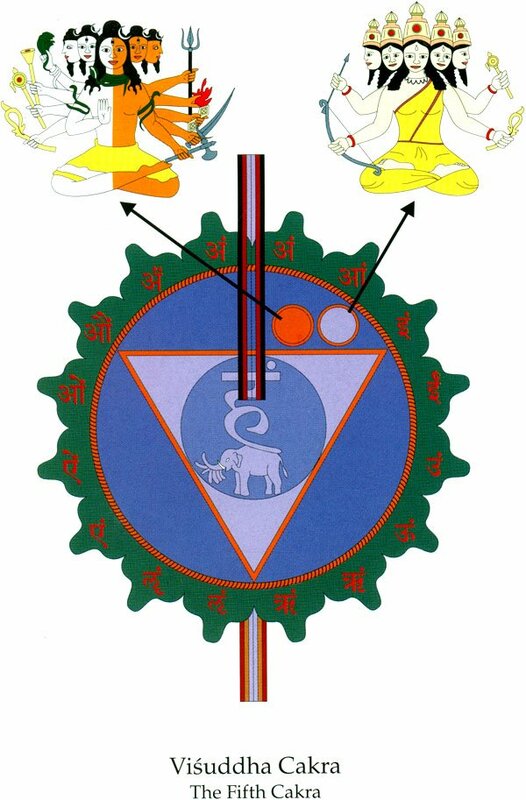 Here an attempt has been made to present the various aspects like Kundalini, Nirguna Brahman,, Parasakti (i.e., primordial energy) of the goddess, with a view to enlightening the devotees for their spiritual advancement. I have also arranged topic wise the thousand names of the Goddess Lalita and their critical analysis presented for the first time. This work, which attempts to present in short the fundamentals of Sakta philosophy, is perhaps the first comprehensive and critical study of the LS by itself. The study is presented in six chapters. Chapter 1 deals with the origin and development of sahasranama literature and the importance of the LS. Chapter 2 focuses on the date, home and authorship of the LS. 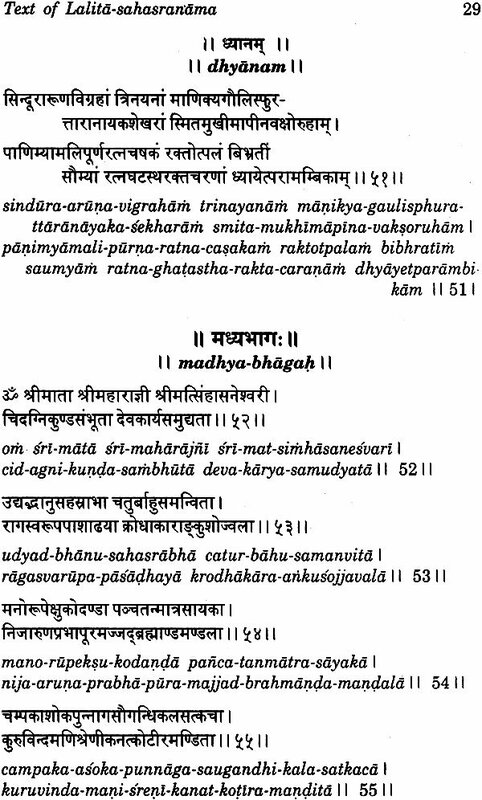 The complete LS in its original form in Sanskrit along with its transliteration in English is given in chapter 3. 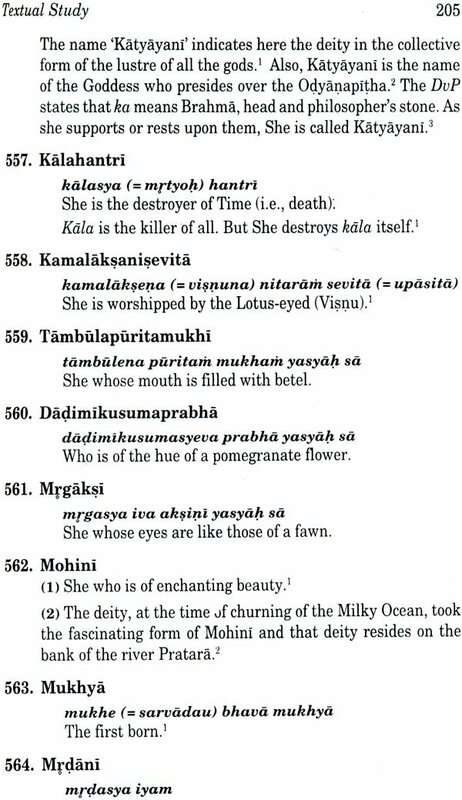 Chapter 4 is the texual study of the one thousand names of Goddess Lalita, in which the thousand names are interpreted and explained with dissolution of compounds after Bhaskararaya, the famous commentator on the LS. In chapter 5, the critical and analytical study of the thousand names is attempted. 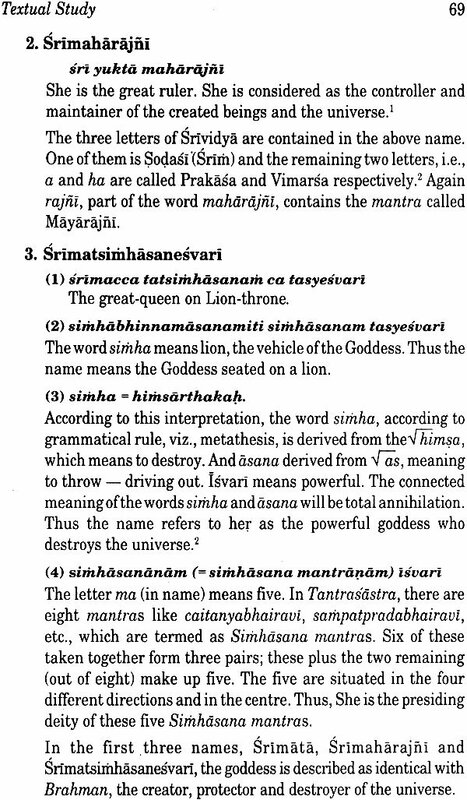 Chapter 6 concludes the study by explaining the significance and place of the LS in the Tantric and sahasranama literature and points out the literary beauty of the LS. 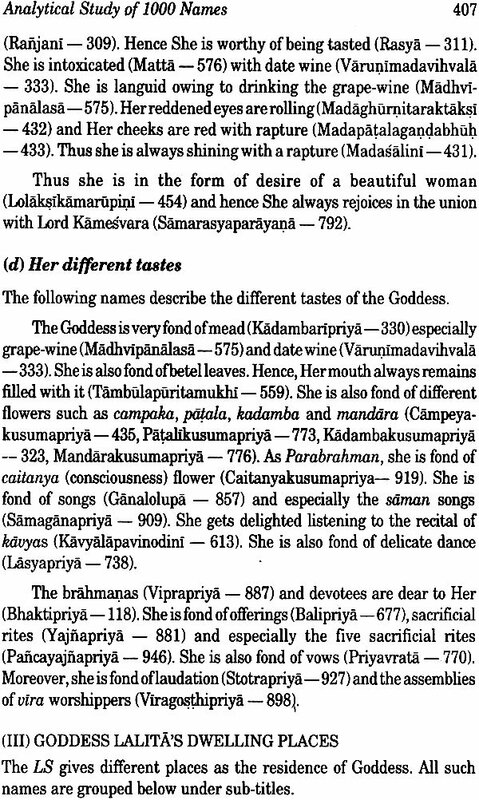 The study ends with an Appendix that lists alphabetically the thousand names of the Goddess. I have studied all the available works written on the LS in different languages and also the other relevant works on Tantrasastra so that my study of the text is complete. I am indebted to all the scholars whose works are listed in the bibliography. 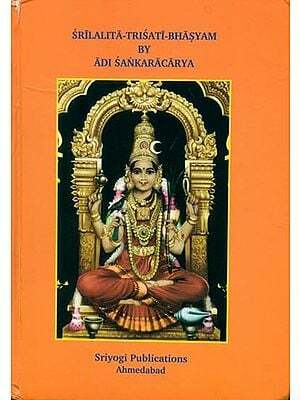 I have extensively used the excellent Saubhagya-Bhaskara of Bhaskararaya, the versatile genius of ancient literature, which gives lucid and detailed expression of each and every name of Goddess Lalita. Where the quotations are concerned I have tried to identity a majority of the quotations from the works on Tantra. Some of the quotations from the Puranas could not be identified to the fullest satisfactions. I have contented myself by referring all the unidentified quotations to page numbers in the LSNB (NSP, Bombay, 1919), which I have followed throughout my study. The book named Lalitasahasranama (Yoga Annotation) by T. V. Ramanaiyah is an attempt to interpret the LS from the Yoga point of view. But in most of the cases, his interpretation are far-fetched and unconvincing. Hence they are not mentioned in the present work. I feel that the present work could not have been completed had it not been for the help of many to whom I am indebted. The paternal and personal care of, Dr. Arunodaya N. Jani, formerly Head, Department of Sanskrit and Director, Oriental Institute, Baroda, and at present Senior Scholar in Sanskrit Mahavidyalaya, M. S. University of Baroda, Baroda, is enshrined in my heart. From Dr. Jani, a renowned scholar in Tantrasastra, I have had the privilege of gaining invaluable masterly guidance. I am indebted to him more than I can express in words. My thanks to the M. S. University of Baroda for kindly permitting me to publish this study. I am also heartily grateful to my father Late Pandit Mohanlal Shastri who, in spite of his old age and always been by my side, guiding me. Only with his blessings I could complete this work. I express my heartily thanks to Mr. S. K. Mittal, Director, D. K. Printworld or the publication of this book in the best possible manner. I shall consider myself well-rewarded I this book proves to be of great benefit to those or whom it is meant.